This article will cover information on Prolotherapy including general questions on Prolotherapy treatments, side effects, research, reviews and medical studies. Prolotherapy is an in-office injection treatment that research and medical studies have shown to be an effective, trustworthy, reliable alternative to surgical and non-effective conservative care treatments. In our opinion, based on research and clinical results, H3 Prolotherapy (H3 is a type of Prolotherapy named after three of its leading physican innovators Hemwall-Hackett-Hauser) is superior to many other treatments in relieving the problems of chronic joint and spine pain and, most importantly, in getting people back to a happy and active lifestyle. This is why it is the Caring Medical treatment method of choice. 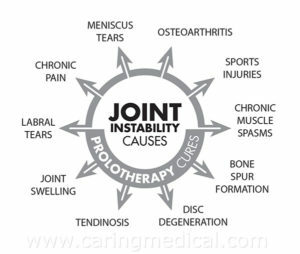 H3 Prolotherapy, through a series of injections, REBUILDS the joints from within. Scientific studies are revealing that each of us harnesses tremendous regenerative capabilities in our own cells and tissues. The field of medicine that specializes in this is called regenerative medicine. 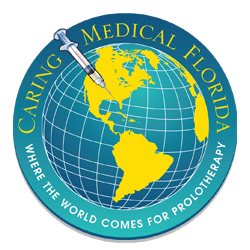 Prolotherapy, also known as regenerative injection therapy, is a specific type of regenerative medicine that uses biological substances to start or restart the regenerative healing cascade to repair musculoskeletal injuries. A clinician who specializes in this type of treatment is called a Prolotherapist. The ideal proliferant (the injectable material) for use in Prolotherapy should be able to naturally stimulate the body’s own healing mechanisms to repair tissue. When a person sustains any type of musculoskeletal injury, the cells in our body react to that injury by bursting open and releasing many “response to injury,” chemicals and substances into the blood and surrounding areas of the wound. One of these substances is the sugar d-glucose, which is also known as dextrose. The release of these compounds initiates the body’s inflammatory healing cascade. The body heals spontaneously. As soon as you are injured, the body starts healing. When we have chronic, wear and tear, and degenerative damage to our joints and spine, there is more damage than the body can fix. Just as we heal spontaneously, degenerative joint disease damages spontaneously. In chronic conditions we are being damaged more than we can heal. Comprehensive H3 Prolotherapy is the treatment that can restart the initial, accelerated healing process because it uses dextrose as the proliferant, which is the same substance released by the body in repsonse to injury. By doing so, Prolotherapy simulates as closely as the possible, the exact healing cascade that is needed to heal injured soft tissues, such as tendons or ligaments. Dextrose has been shown to increase the level of various growth factors involved in healing, growth factor, transforming growth factor-β, vascular endothelial growth factor, and fibroblastic growth factor. (See Figure 7-1.) Comprehensive Hackett-Hemwall Prolotherapy involves injecting the dextrose proliferating solution at the bone-ligament junction (the enthesis) where the injury is typically located, although injections are sometimes given directly into the joints (intraarticularly). This basic Prolotherapy solution used fat our Oak Park office since the 1950s includes the above mentioned hypertonic dextrose (1­2.5% concentration) along with an anesthetic. In our office, we often include other natural substances, such as Sarapin. The dextrose makes the solution more concentrated than blood (hypertonic), acting as a strong proliferant. Sarapin is used to treat nerve irritation and, in our experience, acts as a proliferant. Sarapin is an extract of the pitcher plant and is one of the few materials listed in the Physicians’ Desk Reference that has no known side effects. Procaine is an anesthetic that helps reinforce the diagnosis because the patient will experience immediate pain relief after the Prolotherapy injections. The current Prolotherapy technique described here has been administered by Dr. Hemwall and our clinic to thousands of patients, administering millions of injections over the years. Many body parts can be treated at the same visit, which is convenient and cost-effective for patients who have multiple painful joints or more complex chronic pain, or for patients who travel to us from out of the region or country. In our aggressive comprehensive Prolotherapy approach, we may add additional proliferants, this may be bone marrow or adipose derived stem cells and blood platelets as used in PRP (Platelet Rich Plasma Therapy). Most treatments are given every four to six weeks to allow time for growth of the new connective tissues. We are often asked how many treatments are needed? This is dependent upon the person’s overall health status, the extent of the condition, injury, tear, or arthritis. In our clinical experience, as well as in our research, we find the number of treatments that help a person attain their goal averages 3 to 6 visits. Because we treat a wide variety of cases, from young athletes with acute injuries to the elderly who have suffered through numerous surgeries and decades of anti-inflammatory pain medication, we work to tailor the treatment plans to the patients’ individual goals and needs. High level athletes may have more aggressive treatment needs than a retiree who does not desire to do a lot of activity. Thus, it is imperative to seek a practitioner who not only practices a thorough technique and has access to all types of solutions, but also who understands sports medicine and rehabilitation for patients to do between treatments. Prolotherapy is a regenerative injection treatment used to repair incomplete healing of the ligament and tendons. The major cause of degenerative arthritis and chronic pain is joint instability which involves ligament injury. Injured ligaments need to be correctly treated in order to fully restore joint stability. Prolotherapy treats and rebuilds ligaments. Prolotherapy is considered a viable alternative to surgery, as an option to pain medications and anti-inflammatory injections such as cortisone and other steroidal injections in instances of joint instability and osteoarthritis. Prolotherapy is given without the use of narcotic medications, anti-inflammatory medications, and steroid solutions, as these inhibit healing. The Prolotherapy procedure is considered a safe, affordable option that allows the patient to keep working and/or training during treatment. It is typically best to treat all or most of the ligaments of an unstable joint if that joint or its surrounding structures are painful. Multiple joints and structures can be treated with each visit. The treatments are generally given every four to six weeks to allow sufficient time for new collagen growth. Most commonly in our office, most patients receive monthly treatments, but in certain urgent healing situations, they can be given up to weekly. As regenerative medicine advances, Prolotherapy practitioners are taking notice of which methods can be incorporated into dextrose Prolotherapy treatments to help direct a person’s own stem cells and/or growth factors into the exact places where healing needs to take place within a joint. This is called Autologous (From your own cells) Prolotherapy, or Cellular Prolotherapy. In our office, we utilize Platelet Rich Plasma (PRP) Prolotherapy, which involves concentrating platelets/growth factors found in the blood and injecting them directly into the joint. We also offer Stem Cell Therapy (Stem Cell Prolotherapy) using a person’s own bone marrow and/or fat cells, which are collected and injected during the same day procedure. With any Cellular Prolotherapy procedure done in our office, patients also receive dextrose Prolotherapy to the surrounding joint attachments, in order to ensure the area of pain and instability is comprehensively treated. For patients who are looking into Prolotherapy, please understand that this is a specialty procedure with technique and experience being a key component. What we present on our website is based on our experience and research and does not apply to all practitioners or injection therapies. 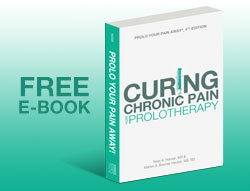 Prolotherapy is supported in the treatment of pelvic pain in patients who fail to respond to conservative therapies. . . Overall, Prolotherapy has been demonstrated to be efficacious and should be considered as a treatment for pain and dysfunction associated with chronic musculoskeletal conditions, particularly tendinopathies and osteoarthritis. Prolotherapy is given to the articular ligaments of the entire spine, pelvis and peripheral joints to tighten unstable joints. Case series have documented the efficacy of Prolotherapy for ligament injuries of the sacroiliac joint 12-14, low back 15-16, neck 17-18, shoulder 19, elbow 20, knee 21-22 temporomandibular joint 23,24 and other articulations 25. Most of the joints in the body are synovial joints, or freely movable joints. These joints function as a result of the unique properties of the articular cartilage that covers and protects the ends of the bones. If the cartilage is damaged or removed, so is the functioning of the joint, which suffers as bone rubs against bone instead of cartilage over cartilage. hip replacement: replacement of the joint in which the diseased bone tissue and cartilage is removed from the hip joint, replacing the head of the femur (the ball) and the acetabulum (the socket) with new, artificial parts; the healthy parts of the joint are left intact. Learn more about Prolotherapy as a hip replacement alternative. Surgery is traumatic; it puts stress on the body and could cause the individual to feel less confident using the surgerized limb. Surgery irreversibly alters the individual’s anatomy. Surgery potentially involves all kinds of complications. Surgery can lead to long-term arthritis due to the removal of significant tissue that is needed to help the body bear weight, such as cartilage, meniscus and disc tissue. Rehabilitation is much longer after surgery than for more conservative measures, such as Prolotherapy. Surgery does not always resolve the pain, which either means it did not address the cause of the pain, or that it caused another problem. What are the goals of H3 Prolotherapy treatments? Better function: Is the patient’s ability to function in activities of daily living improved? Is the patient able to perform previously painful activities without pain? Patients are typically advised to continue to receive Prolotherapy treatments until able to stably perform that certain function without pain or instability symptoms. For example, if a patient can now climb two flights of stairs without knee pain after Prolotherapy, whereas prior to the Prolotherapy this would cause excruciating pain, then we know that Prolotherapy is helping improve function. Increased strength: Ligament and tendon injury may cause muscle strength to decline. When a person receives Prolotherapy, one of the noticeable effects of the treatment is that strength improves in the injected areas. Alleviate pain: The most common reason patients receive Prolotherapy is to resolve pain by repairing the pain-causing structures. Thus, a noticeable decrease in pain shows the benefit of successful Prolotherapy. Eliminate stiffness, swelling, and spasms: Most patients with chronic pain complain of stiffness, swelling, and/or muscle spasms. These are natural responses by the body to protect injured or unstable joints. Patients commonly experience these symptoms after performing a certain activity. A great sign that Prolotherapy is working is that stiffness, swelling, and muscle spasms have subsided. Once Prolotherapy helps stabilize the area involved, the muscles no longer have to provide this stability so they relax. Once they relax, the stiffness and spasms subside. Same with joint swelling: as stability improves, the joint will not chronically swell. Improved physical examination findings: An experienced Prolotherapy provider should be able to assess whether the treatment is working by simple physical examination. He or she can also listen for crepitation or crunching in the joints which can often be audibly heard by moving the joint. The joint that doesn’t crunch is also improving. Static X-rays and MRIs are poor indicators that Prolotherapy is working, the reason being that most ligaments do not show up well on these tests, which are used more in surgical cases. Musculoskeletal ultrasound is a much better tool for Prolotherapists because it can correlate other physical exam findings with ligament laxity and joint instability. Digital Motion X-ray also has advantages over static X-ray and MRI because it allows the patient and provider to see instability when the joint/spine is in motion, as well as improvement with the treatment series. We are asked by every patient: Do the injections hurt? This depends on the condition and a person’s own pain tolerance. Most people surprise themselves at how well they do during a treatment because it is over in a matter of minutes. What are the options for providing a “painless” Prolotherapy procedure? Anesthetic spray for the skin. This is applied shortly before treatment and helps to reduce the pain when the needle pierces the skin. The needle piercing through the skin is generally the most painful part of the procedure. Pre-medication for anxiety and pain may be prescribed to help you relax and dull the pain from the treatment. Local anesthetic or a nerve block may be used around the area prior to starting the treatment. Nitrous gas is an available option. Relaxing aromatic and topical essential oils are pleasant options for those who prefer a more natural approach. Sometimes squeezing a stress ball or deep breathing is all that is needed. Conscious sedation is an option for select cases in the Florida office location. For those requiring Prolotherapy injections in many areas at one time or in delicate areas, some form of nitrous, sedation, or other medication is often suggested, such as with Ehlers-Danlos patients, or in cases where the pain of the condition itself already an excruciating “10 out of 10,” such as in cases of Chronic Regional Pain Syndrome. After treating thousands of patients who claim how much they “hate needles” (rest assured, these patients make it through just fine), it is good to remember that the goal of the treatment outcome should outweigh any hesitancy about the discomfort during the procedure, especially when there are now better options than ever to reduce procedural pain. Most of our patients receive Prolotherapy without the help of medication and do just fine! Because Prolotherapy causes inflammation, the person will often note some bruising, pain, stiffness and swelling in the area after receiving Prolotherapy. Typically this lasts 1 to 7 days. On rare occasions, it lasts longer. Lasting longer is not necessarily bad, some people just inflame more easily. Since the treatment works by inflammation, lingering pain after Prolotherapy can be a sign of healing. 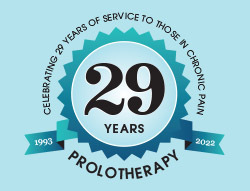 If the pain is severe after Prolotherapy, then call the office where the Prolotherapy was done. Prolotherapy should not cause excessive, severe pain. Severe pain after Prolotherapy, especially accompanied by a fever, could indicate an infection. Infection after Prolotherapy is the most serious risk that we have seen. The risk of infection after Prolotherapy is between 1 and 1000 to 1 and 10,000 procedures. The most common infection with Prolotherapy is an infection in the skin. This type of infection typically responds to an antibiotic taken by mouth. If a joint or blood infection results, then intravenous antibiotics will typically be needed for six weeks. Since some of the risks with Prolotherapy relate to the actual technique or solutions used, it is important to go to a clinic with a lot of experience and one who has researched the best options for various types of pain, versus just utilizing the same ingredients for every patient. View our main page about Prolotherapy for knee pain. Research conducted by our team members at Caring Medical and independent investigators have found Prolotherapy to be an effective non-surgical treatment for various knee pathologies and degeneration. Doctors from the University of Wisconsin continued their research into Prolotherapy. They found Prolotherapy resulted in safe, significant, progressive improvement of knee pain, function and stiffness scores among most participants and continued as such at follow up an average of 2.5 years after initial treatment. See this page for articles for Prolotherapy addressing various disorders including knee ligament and tendon damage, kneecap problems, and sports-related injuries. Comprehensive Prolotherapy is an injection technique utilizing many healing factors. They can include or be used in conjunction with Dextrose, Blood Platelets, and stem cells. The stem cells and blood platelets are drawn from you the patient. In research, PRP by itself has been shown to be a remarkable treatment for knee osteoarthritis. However, other research points out that PRP’s effects may not be long-lasting or beyond six months.33 At Caring Medical we developed comprehensive Prolotherapy and inject the supportive structures of the knee with dextrose Prolotherapy and other growth factors. Simply, while PRP can address and repair damaged cartilage, it is not addressing the ligament and tendon weakness that contributed to the cartilage deterioration. Comprehensive Prolotherapy seeks to repair the entire knee. Platelet Rich Plasma Therapy for Osteoarthritis of the knee and bone on bone on our website. View our main page about Prolotherapy for back pain. Caring Medical patients are often surprised to learn that Prolotherapy can heal most disc problems in neck and back. While we talk about Prolotherapy healing joint pain that results from ligament and tendon injuries, most people are unaware that disc problems results from ligament injuries or instability along the spine. Patients with degenerative disc disease, herniated discs, bulging discs, bone on bone, etc can all be healed with Prolotherapy. Prolotherapy works to stabilize the ligaments of the spine allowing discs to get back into position and can even create space for a person who has lost space due to one or more degenerated disc. In Prolotherapy research from the doctors of Caring Medical, patients with more than four years of unresolved low back pain were shown to have had their pain improved, stiffness, range of motion, and quality of life measures even 12 months subsequent to their last Prolotherapy session.35 More information can be found on these pages on our site Prolotherapy for Chronic Low Back Pain. View our main page about Prolotherapy for shoulder pain. View our main page about Prolotherapy for hip pain. We examined Sixty-one patients, representing 94 hips, who had been in pain an average of 63 months We treated these patients quarterly with Hackett-Hemwall dextrose Prolotherapy. 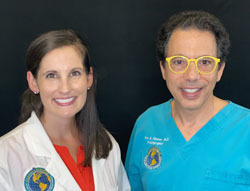 Dr. Ross Hauser and our team have published a number of research papers, case studies, and scientific editorials in the Journal of Prolotherapy, including articles on Prolotherapy as an alternative to surgery; Prolotherapy for chronic back pain; cartilage regeneration in knees; Stem cell therapy for degenerative joint disease; Prolotherapy as for meniscus tears, and many, many more. Osteoarthritis Pain: Can Prolotherapy Help? 5. Hackett G. Joint stabilization: An experimental, histologic study with comments on the clinical application in ligament proliferation. American Journal of Surgery. 1955;89:968-973. 6. Kim HJ, Kim SH, Yun DH. The effects of anti-inflammatory drugs on histologic findings of the experimental prolotherapy model. Journal of the Korean Academy of Rehabilitation Medicine. 2006;30:378-384. 10. Harman R, et al. A retrospective review of 62 cases of suspensory ligament injury in sport horses treated with adipose-derived stem and regenerative cell therapy. Proceedings of the Veterinarian Orthopedic Society, 2006. 11. Dahlgren LA. Use of adipose derived stem cells in tendon and ligament injuries. American College of Veterinarian Surgery Symposium on Equine Small Animal Proceedings. 2006;150-151. 12. Hackett, G. Shearing injury to the sacroiliac joint. Journal of the International College of Surgeons. 1954;22:631-642. 15. Hackett G. Back pain following trauma and disease-Prolotherapy. Military Medicine. 1961;July:517-525. 16. Hackett, G. Low back pain. The British Journal of Physical Medicine. 1956;19:25-35. 19. Jo D, Ryu K, Yang S. The effects of Prolotherapy on shoulder pain. Korean Journal of Anesthesiology. 2004;46:589-592. 21. Kim JM. The effect of prolotherapy for osteoarthritis of the knee. Journal of the Korean Academy of Rehabilitation Medicine. 2002;26:445-448. 22. Reeves KD, Hassanein K. Randomized prospective double-blind placebo-controlled study of dextrose prolotherapy for knee osteoarthritis with or without ACL laxity. Alternative Therapies. 2000;6:68-79. 23. Hakala RV. Prolotherapy in the Treatment of TMD. The Journal of Craniomandibular Practice. 2005;23:1-6. 24. Schultz, L. A treatment of subluxation of the temporomandibular joint. Journal of the American Medical Association. September 25, 1937. 25. Reeves KD, Topol GA, Fullerton BD. 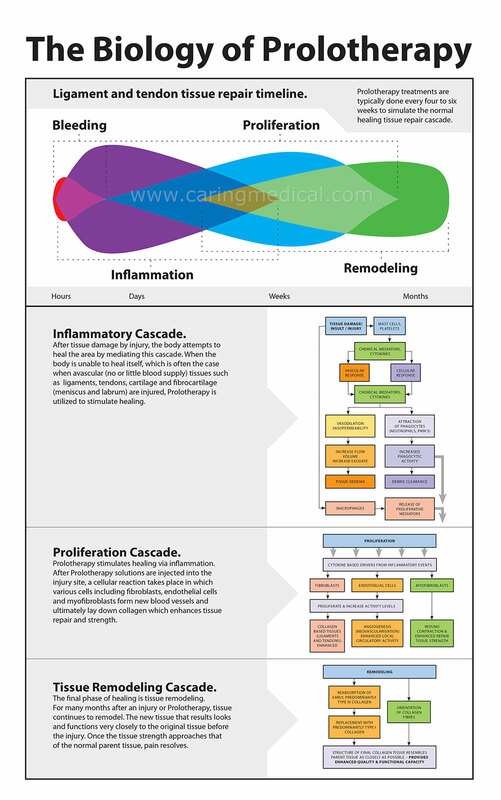 Evidence-based regenerative injection therapy (prolotherapy) in sports medicine. In Seidenberg PH, Beutler PI. (Eds). The Sports Medicine Resource Manual. Saunders (Elsevier); 2008:611-619. 26. Rabago D, Mundt M, Zgierska A, Grettie J. Hypertonic dextrose injection (prolotherapy) for knee osteoarthritis: Long term outcomes. Complement Ther Med. 2015 Jun;23(3):388-95. doi: 10.1016/j.ctim.2015.04.003. Epub 2015 Apr 8. 27. Hauser RA, Hauser MA. A Retrospective Study on Dextrose Prolotherapy for Unresolved Knee Pain at an Outpatient Charity Clinic in Rural Illinois Journal of Prolotherapy. 2009;1(1):11-21. 28. Rabago D et al. Association between disease-specific quality of life and magnetic resonance imaging outcomes in a clinical trial of prolotherapy for knee osteoarthritis. Arch Phys Med Rehabil. 2013 Nov;94(11):2075-82. doi: 10.1016/j.apmr.2013.06.025. Epub 2013 Jul 10. 29. Rabago D. et al. Dextrose prolotherapy for knee osteoarthritis: a randomized controlled trial. Ann Fam Med. 2013 May-Jun;11(3):229-37. doi: 10.1370/afm.1504. 30. Hauser RA. The Regeneration of Articular Cartilage with Prolotherapy. Journal of Prolotherapy. 2009;1:39-44. 31. Topol GA, Podesta LA, Reeves KD, Giraldo MM, Johnson LL, Grasso R, Jamín A, Tom Clark DC, Rabago D. The Chondrogenic Effect of Intra-articular Hypertonic-dextrose (prolotherapy) in Severe Knee Osteoarthritis. PM R. 2016 Apr 4. pii: S1934-1482(16)30054-5. doi: 10.1016/j.pmrj.2016.03.008. 29. Reeves KD, Hassanein KM. Long-term effects of dextrose prolotherapy for anterior cruciate ligament laxity. Altern Ther Health Med. 2003 May-Jun;9(3):58-62. 30. Khoshbin A, Leroux T, Wasserstein D, Marks P, Theodoropoulos J, Ogilvie-Harris D, Gandhi R, Takhar K, Lum G, Chahal J. The efficacy of platelet-rich plasma in the treatment of symptomatic knee osteoarthritis: a systematic review with quantitative synthesis. Arthroscopy. 2013 Dec;29(12):2037-48. doi: 10.1016/j.arthro.2013.09.006. 31. Stem Cell Therapy and Prolotherapy research Hauser RA, Orlofsky A. Regenerative injection therapy with whole bone marrow aspirate for degenerative joint disease: a case series. Clin Med Insights Arthritis Musculoskelet Disord. 2013 Sep 4;6:65-72. doi:11.4137/CMAMD.S10951. eCollection 2013. 32. Hauser RA, Hauser MA Dextrose Prolotherapy for Unresolved Low Back Pain: A Retrospective Case Series Study Journal of Prolotherapy. 2009;3:145-155. 33. Hauser RA, Hauser MA Dextrose Prolotherapy for Unresolved Low Back Pain: A Retrospective Case Series Study Journal of Prolotherapy. 2009;3:145-155. 34. Steindler A, Luck JV. Differential diagnosis of pain low in the back JAMA. 1938;110(2):106-113. 35. Hauser R, Hauser M, A Retrospective Study on Hackett-Hemwall Dextrose Prolotherapy for Chronic Hip Pain at an Outpatient Charity Clinic in Rural Illinois. Journal of Prolotherapy. 2009;2:76-88. 36. Rabago D, van Leuven L, Benes L, Fortney L, Slattengren A, Grettie J, Mundt M. Qualitative Assessment of Patients Receiving Prolotherapy for Knee Osteoarthritis in a Multimethod Study. J Altern Complement Med. 2016 Sep 7. 37. Bertrand H, Reeves KD, Bennett CJ, Bicknell S, Cheng AL. Dextrose Prolotherapy Versus Control Injections in Painful Rotator Cuff Tendinopathy. Arch Phys Med Rehabil. 2016 Jan;97(1):17-25.